Set up by Todd and Courtney, who worked together at the now defunct Avenue Coffee Roasting Co, I first learnt about The Good Coffee Cartel at last year’s Glasgow Coffee Festival 2017, when I ran into Todd, who told me about plans for a new roastery and coffee shop. Naturally, on my return to Glasgow for this year’s festival, I made a beeline for the new space on Glasgow’s south side. The Good Coffee Cartel is a curious mixture: quirky coffee shop, roastery, ceramics workshop: it’s all these and more. The roastery is very clearly the backbone of the business, the vintage 15kg Probat sitting in the corner at the back. However, it’s also a spacious coffee shop, with a soon to be added back garden, somewhere you can sit all day and enjoy whatever excellent coffee Todd and Courtney have on that day, with different options on espresso and batch-brew, all served in cups that have been handmade on site. Even better is the pricing structure: all the coffee is £2, all the cakes are £2 and if you really want to push the boat out, you can have an espresso, espresso with milk and batch brew for £5. The Good Coffee Cartel occupies a single-storey building on Cornwall Street, a dead-end street linking the busy Paisley Road with Kinning Park subway station, making it easy to reach from all parts of Glasgow. The building is believed to once have been a row of tenements that may have been bomb damaged. Whatever the reason, the top floors were taken down, just leaving the ground floor, The Good Coffee Cartel occupying the left-hand end, a space that once might have been three tenements. The result is a large, open, rectangular space with lots of weird architectural features to fascinate people like me. The décor is an intriguing mix of chipboard, exposed brick and upcycled furniture, including the pallets that the roaster was delivered in. The space acts as a coffee shop, roastery and ceramics studio. And, for that matter, whatever Todd and Courtney want it to be. There’s a large, open space at the back, accessible from the street, that is currently a work-in-progress, but which one day will become a garden/outdoor seating area. In the meantime, you’ll just have to make do with the lovely interior. The coffee shop part of The Good Coffee Cartel occupies front of the right-hand and middle two tenements, the back acting as a kitchen/production/admin area which houses, amongst other things, the Fetco brewer. To the left, the third tenement has the ceramics studio at the front, with the roaster, a 15kg Probat, which dates from 1955, at the back. Right at the back are two circular structures which were probably stairwells to the (now non-existent) upper floors. The one on the left, by the roaster, is now the lab/cupping room, while the other, behind the kitchen to the right, houses the toilet and, remarkably, still has the start of the stone spiral staircase. The layout is simple enough, although subject to change. Courtney told me that in the six months that they’ve been open, it’s changed at least once a month. The door, which is on the left, is probably the location of the original front door to the tenements, which would have opened onto a long corridor running the depth of the building. The coffee shop stretches out to the right, starting with a chipboard bench that runs along the four windows at the front, with small stools, one per window, acting as coffee tables. The counter is effectively a long, chipboard table, which runs from front-to-back, but, unusually, it faces the party wall that separates coffee shop from ceramics workshop. This makes sense from a flow perspective, since you walk pretty much straight in from the door and the counter is there, on the right. However, it means that the bulk of the seating is behind the counter, which is ideal, if, like me, you like to sit and watch the baristas at work, in this case on the two-group Kees van der Westen Mirage. Aside from the window bars, there’s a low, six-person communal table made of pallets, with individual benches for seats that probably offers the best view of the espresso machine, while behind that is a trestle table, this time made from the roaster pallets, in a brick-walled alcove. The back wall is probably all that’s left of the internal wall separating the front/back of the tenement, while the left-hand part of the alcove is the remains of the party well between the two tenements. All this means that you can’t see the counter from there, although on the plus side, the wall has several power sockets. The right-hand wall is taken up with retail shelves, stocking ceramics, including cups, bowls, jugs and a lovely Kalita Wave style filter. And, of course, beans. When it comes to coffee, there’s one option on espresso, another on batch-brew. During my visit, the espresso was an experimental blend, a combination of a Colombian and a Costa Rican, with the Costa Rican available on its own on batch brew. However, the specific bean on batch changes through the day (currently Colombia, Costa Rica or Peru), while the espresso (usually a single-origin) changes every week or so. If you’re hungry, there’s a small selection of cakes. I tried both the espresso and the batch-brew. On its own, the Costa Rican was a very drinkable filter coffee, but really came into its own in the blend, its sweetness combining with the tartness of the Colombian to produce a beautifully, well-balanced espresso. On this basis, I say The Good Coffee Cartel should carry on experimenting! 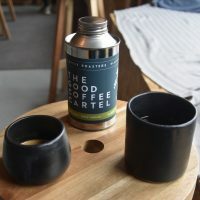 December 2018: The Good Coffee Cartel was a runner-up for the 2018 Most Passionate About Coffee Award. This entry was posted in Cafe/Roaster, Coffee Gardens, Coffee Shops, Glasgow, Island Counters, Laptop Friendly, Retailers, Roastery, Stations Nearby and tagged include by Brian Williams. Bookmark the permalink.